I decided this weekend I wouldn't have a theme to my marathon. I will just be watching whatever I am in the mood for... when I am in the mood for it. If you think special government agent James West is fast with a six-shooter, wait'll he lays a quip on you! Megahit star Will Smith plays West, reuniting with Men in Black director Barry Sonnenfeld in an effects-loaded, shoot-from-the-lip spectacular. Kevin Kline plays fellow agent and crackerjack inventor Artemus Gordon, teamed with West on a daring assignment: stop legless Dr. Arliss Loveless (Kenneth Branagh) and his diabolical plot for a Disunited States of America. Salma Hayek is mysterious adventuress Rita Escobar. And all manner of geared-up 1860s gadgets - from belt-buckle derringers to surprise-packed billiard balls to a walking, eight-story, steam-and-steel tarantula - help make Wild Wild West a Wow Wow West! I can't say how true to the series this movie is... as I don't remember ever seeing the series before. If I remember correctly I bought this purely on the star power of Will Smith. 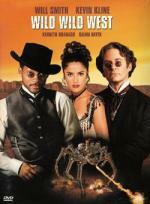 I did find it to be a bit on the weird side what with all the gadgets and such set back in the Old West times. But it entertaining all the same. It is just one you can not take seriously. This is a low-budget (I believe) direct to video horror movie. It's main star is Treat Williams... who is well known in the area of B-Movies. Even though he has never really impressed me in anything I seen him in... he doesn't bother me either. Even with it being low budget it does have a decent quality. Also has a pretty good story. But it is not a movie that will find it's way into any of my favorites lists. It is just an average horror flick... I would say if you can find it cheap it may be worth adding to your collection. But you may want to rent it... or catch it on cable first. Publish or perish! Alex has just 30 days to finish his rmance novel and collect his writing fee – money he owes to loan sharks threatening his life. So stressed-out Alex hires Emma to be he stenographer and discovers she's opinionated, direct, a cause of exasperation... and a source of inspiration. 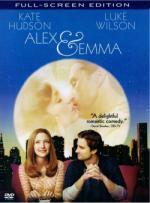 From director Rob Reiner (When Harry Met Sally...) comes a movie about when Alex met Emma, a fun affair set in both the modern world Emma (Kate Hudson) and Alex (Luke Wilson) share and the 1920s Gatsby-like world of the book they're creating. With love & laughs, wit & imagination, Alex & Emma writes the book on romance. It's "the best romantic comedy of the year" (Jim Ferguson, FOX-TV). This is a movie I have never seen before. A very good friend gave me this DVD when she was cleaning out her collection. Unfortunately it is the Full-Screen edition... which of course I always prefer OAR releases. But I can't complain.... a free dvd is a free dvd! I definitely do enjoy a good romantic comedy. Unfortunately I wouldn't call this one a good romantic comedy. I tried to enjoy it... but I just found it more or less boring... and found it difficult to even get through. I was actually laying down watching this movie and found myself fighting sleep in no time. I didn't care for the whole idea of flashing to acting out the book he is writing. I can see how some would like such a thing... but for me it took away from the story more then it added to it. I definitely do enjoy a good romantic comedy. Unfortunately I wouldn't call this one a good romantic comedy. I know you're only recently converted to older films, so if you like romantic comedies, I definitely recommend It Happened One Night which I recently reviewed for the Oscar-thon. Then James Stewart again in The Philedelphia Story. You can't really beat either of those. Thanks for the rcommendations Jon! Agent Jay (Will Smith) and Agent Kay (Tommy Lee Jones) are turning up the heat on alien terrorists and delivering hot new technology at the same time. Experience the galaxy's biggest sci-fi hit with a universe of exclusive special features, including 3 scene editing workshops, technical commentary and more! This movie is just plan fun for me. It is a really good "Turn your brain off... Popcorn Movie"... it has a nice amount of laughs. 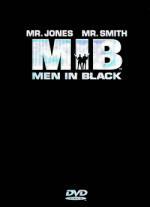 I enjoyed the performances of both Will Smith and Tommy Lee Jones in this movie. I especially enjoyed Will Smith firing off that little gun of his... the "Noisy Cricket". If you just want some mindless entertainment for about an hour and a half... this one I will recommend. Oh, Jimmy! Look at that big wrong you did all over the page! Will Smith is first a movie star, second an actor, but he is a very good actor. However, if you don't like the personality, you won't like the actor, so I fear he has zero chance with you! He was excellent in Ali, although as you say, he didn't need to be because Ali is enough appeal on his own. But he was essential to MIB, and Enemy of the State for that matter; the older star in each case needed him more than the other way around, because no matter how good they are, it wasn't their film. Transplant Smith with any other actor in those movies... bomb. You're far too cynical regards Independence Day. Smith made it viable and watchable. Without him... bomb. Well, maybe not, but a damn sight less successful. But you're right with Enemy of the State, I like this movie and I can tolerate him in it. Every rules need an exception, no? No reason to be sorry!... to me it was just an entertaining average movie. Guess I wasn't as clear about that as I thought. No, you were clear! I was apologising because it's your marathon and I wasn't quoting your review, which is rude. After years of experimentation, Dr. Sebastian Caine (Bacon), a brilliant, but arrogant and egotistical scientist working for the defense department, has successfully transformed mammals to an invisible state and brought them back to their original physical form. Determined to achieve the ultimate breakthrough, Caine instructs his team to move on to Phase III: human experimentation. Using himself as the first subject, the invisible Caine finds himself free to do the unthinkable. But Caine's experiment takes an unexpected turn when his team can't bring him back. As the days pass, he grows more and more out of control, doomed to a future without flesh as the HOLLOW MAN. Kevin Bacon, Elisabeth Shue and Josh Brolin star in this intense thriller filled with extreme suspense, terrifying twists and incredible special effects. This is a movie I have not watched in years. (Last viewing back in January 2001 when it was first released!) I forgot how much I enjoyed this movie. There was some very cool effects in this movie. As well as a good story. I think it did a good job of showing the psychological effects being invisible must have. I never been much of a Kevin Bacon fan... but this is one of the few that I do like him in. 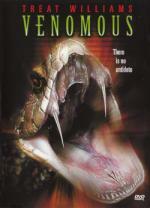 Mainly this one and Stir of Echoes (which is another one I haven't seen in a long time). I really enjoyed Elisabeth Shue in this movie as well. Tom Witzky (Kevin Bacon) is a blue-collar worker, a family man, the most ordinary guy in the world... who is about to be plunged into a shattering encounter with another world. And it doesn't matter that Tom doesn't believe in the supernatural. Because something supernatural has started to believe in Tom. After he is hypnotized at a neighborhood party, Tom changes. He sees things he can't explain and hears voices he can't ignore. As the horrific visions intensify, Tom realizes they are pieces of a puzzle, echoes of a crime calling out to be solved. But when his otherworldly nightmares begin coming true, Tom wants out. He desperately tries to rid himself of his eerie unwanted powers - only to be seized by an irresistible compulsion to dig deeper and deeper into the mystery that is consuming his life. When at last he unearths the truth, it will draw him into the long-buried secret of a ghastly crime, a vengeful spirit... and the lethal price of laying that spirit to rest. After watching Hollow Man I decided to watch this one and make it a Kevin Bacon double bill... As I said before I am not really a fan of his... these two movies is about all I liked with him that I have seen. This is a good twist on a ghost story. I liked how he became "open" to the ghost and what happened by becoming hypnotized. There is this one part of the movie that makes me cringe every time I see it. And it is just a minor thing. But it is one of those things that can be bothersome to some people. Kinda like anything to do with an eyeball. In this case it is a fingernail being ripped off. OUCH! Anyway... this is a good movie. I enjoyed every second of it.